The Brazilian Glow™ collection is formulated to protect skin against free radical damage while providing hydration and anti-aging properties. Teadora, a leader in natural and organic beauty products powered by the Brazilian Amazon Rainforest, is excited to announce the latest additions to its Brazilian Glow™ collection, the Beauty Butter and Ultra-Silky Cleanser. Formulated with proprietary rainforest superfruit elixirs and other powerful anti-aging, plant derived actives, the Brazilian Glow™ collection is formulated to protect skin against free radical damage while providing hydration and anti-aging properties. The Beauty Butter, Skin Superhero for Face and Body is formulated with guarana and amino acids to allow skin to maintain and retain moisture, therefore combatting visible signs of aging. Amino acids are a natural, super moisturizer while the Amazonian superfruit, guarana, provides anti-aging and toning properties. Guarana is often used as a treatment for stretch marks and puffiness given its theophylline and caffeine components, and is known for its anti-inflammatory properties, making it safe for delicate and sensitive areas. The Beauty Butter is also made with Teadora’s proprietary RainforestRestoration™ Elixir, which is infused with invigorating oils and butters of buriti – with higher concetration of pro-vitamin A than all fruits and vegetables, capuaçu – show to be twice as moisturizing as shea butter, andiroba, acai, murumuru, Brazil nut and maracujá. The formulation also includes Phytocell Tech™, an ingredient made from Argan Plant Stem cells, clinically proven to reduce the appearance of fine lines by 26%. In addition to the Beauty Butter, Skin Superhero for Face & Body, Teadora is proud to announce the launch of their new Ultra-Silky Cleanser for Face & Body. Crafted with the brand’s RainforestYouth™ Elixir, vitamins, nutrients and antioxidants of açai, buriti and capuaçu, the Ultra-Silky Cleanser nourishes and protects skin against free-radical damage, provides naturally anti-aging properties and gently cleanses. Both products are toxin-free, vegan, sustainably harvested, sulfate-free and synthetic fragrance-free. All Teadora products are made with naturally active superfruits from the rainforests of Brazil and are fair-trade sourced, sustainably harvested and cruelty free. The brand built their comprehensive approach to sustainability through practices such as beach harvesting with Amazonian communities, local economic empowerment initiatives and relying less on man-made substances. Among the brand’s many initiatives is their trademarked give-back program, “Earth For You. You For The Earth,” which strives to re-plant one million trees and save seventy-five acres in the Amazon Rainforest within the next five years. 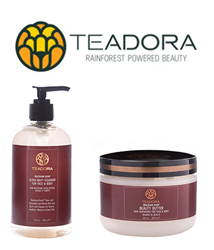 The new Brazilian Glow™ Beauty Butter and Ultra-Silky Cleanser for Face & Body are now available for purchase online via http://www.teadorabeauty.com and at Teadora’s Pop-Up Store located at Pacific Place Mall in Seattle. In Portuguese, “Teadora” means adores you. Teadora shows their love for the world with natural and organic products made with exotic and effective rainforest ingredients. Toxin-Free, Vegan, Cruelty-Free, Sustainably Harvested and Made with love in the USA, their products let you experience the bounty, wisdom and magic of the Amazon – while helping to improve the lives of the communities where we live and do business. Teadora, a B-Corp Certified company, helps to fund a philanthropic exchange between the U.S. and Brazil to promote rainforest conservation, education and leadership development. For more information please visit http://www.teadorabeauty.com.